The government raised the benchmark retail prices of gasoline by 290 yuan (US$42.46) per ton, or 5 percent, and diesel by 180 yuan per ton, or 3.7 percent, as of midnight yesterday. But the National Development and Reform Commission (NDRC), the top economic planner, did not say whether the cuts were for the factory gate price or the retail market. Nor did it specify how the cuts would affect the range of prices for various grades of fuel or in different parts of the country. 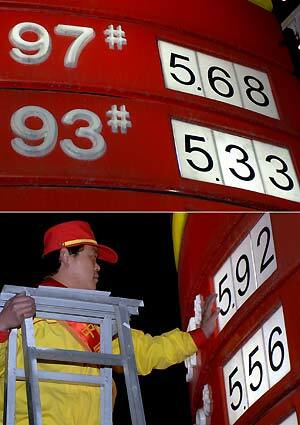 Top quality gasoline in Beijing cost 5.70 yuan a liter Tuesday; and the revised price is expected to be around 6 yuan. It is the second oil price revision this year. The NDRC cut benchmark pump prices of gasoline and diesel by 140 yuan and 160 yuan per ton, or 2 percent and 3.2 percent, on Jan 14. Experts said the frequent price revisions show the government can respond quicker to international oil price changes after a new pricing mechanism took effect on Jan 1. In electronic trading on the New York Mercantile Exchange Tuesday, crude oil was US$53.10, compared to around US$38 at the end of February.